Volume 25 of The Annals is a timely reprise on developmental, psychotherapeutic, and forensic issues that enter into the evaluation and treatment of adolescents. It traverses different explanatory perspectives, offers integrative expositions of several treatment modalities, and wrestles with the legal dimensions of adolescent care. The volume begins with three developmental studies: Shelley Doctors's clinically grounded reconsideration of "adolescent turmoil," Charles Jaffe's dynamic systems approach to adolescent psychotherapy, and Saul Levin's thoughtful consideration of four aspects of the adolescent passage that clinicians tend to ignore: the adolescent's sense of being, of belonging, of believing, and of benevolence. 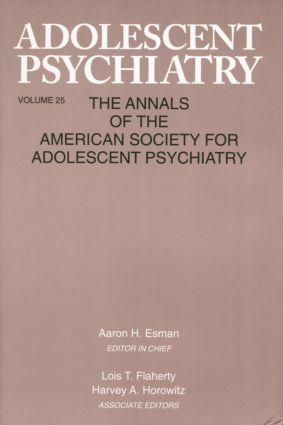 A thorough review of adolescent personality pathology and a case report of adolescent mourning are followed by a series of papers exploring three principal treatment modalities commonly employed in work with disturbed adolescents: psychodynamic, interpersonal, and the integrated approach of the Austen Riggs Center. Consideration of the game of chess as a "method and metaphor" for working with object relationships in narcissistic teenagers concludes the section of material on therapeutic approaches. The final section of volume 25 engages two knotty forensic issues that have come to the fore in adolescent psychiatry. Saul Levin examines the legal and developmental dimensions of the informed consent of minors whereas Everett Dulit outlines three clinical constellations associated with female adolescents' denial of pregnancy and examines their relationship to neonaticide. Like its distinguished predecessors, volume 25 is a thoughtfully assembled collection that not only spans the many facets of adolescent psychiatry but is responsive to the most pressing challenges - evaluative, therapeutic, legal - before the field. Part I: Developmental Issues. Doctors, Attachment-Individuation: Clinical Notes Toward a Reconsideration of "Adolescent Turmoil." Jaffe, Organizing Adolescents(ce): A Dynamic Systems Perspective on Adolescence and Adolescent Psychotherapy. Levine, The Tao and Talmud of Adolescence and Young Adulthood: Being, Belonging, Believing, Benevolence. Part II: Psychopathology in Adolescence. Westen, Chang, Personality Pathology in Adolescence: A Review. Garber, Adolescent Mourning: A Paradigmatic Case Report. Part III: Psychotherapeutic Approaches to Adolescents. Shapiro, Psychoanalysis and Dynamic Psychotherapy in Adolescence. Mufson, Dorta, Interpersonal Psychotherapy for Depressed Adolescents: Theory, Practice, and Research. Fowler, Rosenberg, Integrated Treatment in the Care of Seriously Disturbed Adolescents and Their Families. Gaines, Berkovitz, & Kohn, Chess as a Way of Improving Object Relationships in Narcissistic Teenagers. Part IV: Forensic Considerations in Adolescent Psychiatry. Levine, Informed Consent of Minors in Crucial and Critical Health Care Decisions. Dulit, Girls Who Deny a Pregnancy; Girls Who Kill the Neonate. Aaron H. Esman, M.D., is Professor of Clinical Psychiatry (Emeritus), Cornell University Medical College, and Faculty, New York Psychoanalytic Institute. He is editor of Psychology of Adolescence: Essential Readings and Psychiatric Treatment of Adolescents and author of Adolescence and Culture. He maintains a private practice of psychiatry with adults, adolescents, and children.